Halloween may be over but we are still finishing up several "fall" activities! I am always behind because just as I am about to do an activity I have a "brain pop" and have to tweak it or add more to the activity (PLUS, I am always behind because there is not enough time in the day to teach everything I am supposed to!). 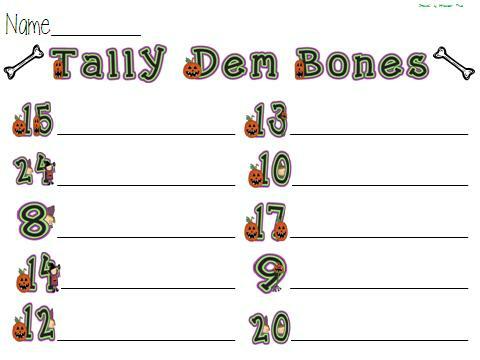 Since we talked about bats last week and bones when we made our Tweet Treat I thought it would be so cute to tally with bones! So this meant we needed to receive another package from the Tweets! On the outside of the package was a note from the Tweets and the riddle puzzles. I L-O-V-E making these riddle puzzles and my kiddos go NUTS for them every year and they are great for teaching so many skills (and all you do is cut a sentence strip into puzzle pieces)! The kiddos worked with their brain buddy to put the riddle clues together and we then put all of the clues in the pocket chart. Riddles are a great way to work on inferring too! 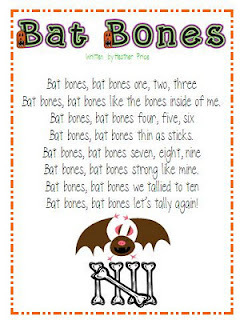 After reading the book, we then read the poem Bat Bones and the kiddos used their bat bones to tally as we read the poem. We then tallied and made other numbers using our bat bones. We used the recording sheets to help us. You can also give children their bag of bat bones to use in a math station or have several sets of bones to use in the math station and the kiddos can take their bat bones home to tally and eat! 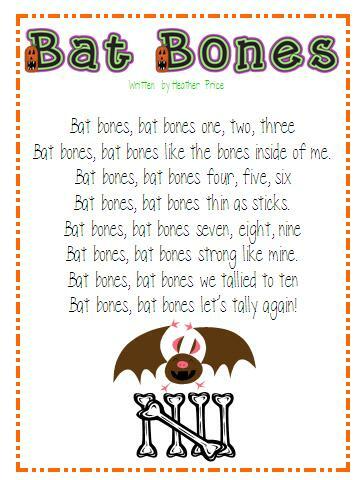 Here is the Bat Bones poem. Here are the tally sheets and the large bones for making the tally marks. Our bat bones were pretzels (and we had some white chocolate covered bones too!). Yes, I had most of my kiddos convinced they were really bones and not pretzels. I have a beaver skull I show the children and I talk to them about how they boil bones to get all of the skin off of them and to clean and sanitize them. So, the kiddos all thought they were eating *dirty* bones! Hahahahahaha I would love to see their parents faces when they tell them some of the things I say (or maybe not)! Thanks, too late for this year. Good thing I have a huge External hard drive. Thanks for sharing. I saved in my "must do" file for next year. Cute activity to practice tally marks. Thanks for sharing! A Gift from God...and a fun freebie!